Jeremy Corbyn has been criticised for staying silent as God Save the Queen was sung. What are people's reasons for refusing to sing along? 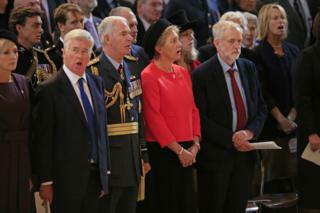 The Labour leader has attracted much criticism for not singing along to the national anthem as it played at a Battle of Britain memorial service. Labour sources have said he will sing it at future official events. But he's not the first public figure to remain tight-lipped as the song plays. Sporting stars have come under regular criticism for failing to join in, and there are those who have principled reasons for not doing so. So why don't they sing along? For those who support an elected head of state, singing in praise of a hereditary monarch is politically problematic. Those who don't believe in the existence of a deity might have problems with it too. People in both categories are in a double bind. "As a republican and an atheist why would I sing the national anthem, or hymns?" asks novelist John Niven, author of the Sunshine Cruise Company. "Belting out praise to entities I don't believe in? It staggers me that people are shocked by this." Fellow republican and Times columnist Janice Turner admires the Queen on a personal level, but would prefer an anthem that celebrates the people of the UK rather than their head of state. "It's the sort of thing you'd sing to Kim Jong Il," she says. You don't have to disagree with the sentiments of God Save The Queen to dislike it. Some people simply consider its melody dirge-like. "Neither the words nor the tune are inspirational or uplifting - compare with Rule Britannia at the last night of the Proms and you can hear the difference a good anthem makes," says Sunday Times columnist Dominic Lawson. He would prefer that it were replaced with I Vow To Thee, My Country, with its stirring music by Gustav Holst and words by Cecil Spring Rice. Others favour Land of Hope and Glory. A popular alternative - at least in England, which, unlike the other UK nations, does not usually have a unique anthem of its own at sporting events - is Jerusalem. In 2012 Prime Minister David Cameron said he'd like English sport teams to adopt it. Plenty of people can't sing. Ex-England footballer Gary Lineker, who was capped 80 times, admitted he hated joining in with the national anthem because he was "hideously bad" at it. For the less mellifluous, weddings and other events that require public singalongs can be excruciating. The best course of action, many decide, is to keep their mouths shut - or, at best, move their lips silently. Others are simply reserved or introverted. When England cricket captain Eoin Morgan stayed silent as the anthem was played, questions were asked about whether the Dublin-born player was making a political statement. His former deputy head teacher told the Daily Telegraph there was another explanation: "He's a very shy fellow. I would imagine he'd be quite self-conscious singing in that context." There is a verse - albeit long disused - that resolves to "crush" the "rebellious Scots". It's a line to which many take exception. "[One] verse is all about Marshall Wade coming up to give us a belt in the mouth," Glaswegian comedian Billy Connolly once complained. "I don't see any rush to Hampden to to crush anybody." He suggested it would be a "refreshing change" to replace it with the theme from the Archers. Not all Scots object. First Minister Nicola Sturgeon of the pro-independence SNP sang along with God Save the Queen last week as Elizabeth II became the UK's longest-reigning monarch. According to the British Monarchy's website, "there is no authorised version of the National Anthem as the words are a matter of tradition", and a maximum of only two verses are ever officially sung. But while 68% of Britons know at least the first verse by heart, some 43% of 18-to-24-year-olds don't, according to a 2014 YouGov study. England captain Wayne Rooney offered to learn the words when he was criticised for not singing along. He now does sing. It's perhaps wiser to keep one's mouth shut if you don't know the words, as former Welsh Secretary John Redwood discovered in 1993 as he struggled to mime along to Hen Wlad Fy Nhadau. The monarch herself typically doesn't sing along when the anthem is played, says Ingrid Seward, editor of Majesty magazine. It might look rather odd if she did. In keeping silent during God Save The Queen, at least, she has something in common with the leader of her loyal opposition. Several of the world's national anthems are shockingly similar to other compositions. Is this because composers pilfer other people's tunes - or does it tell us more about the difficulties of writing an original melody, asks Alex Marshall.